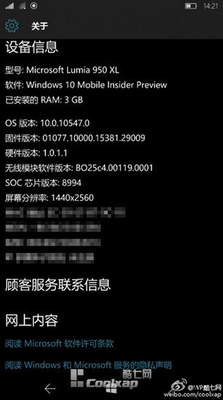 We have new information, about the upcoming microsft Lumia phone called lumia 950XL. From the unconfirmerd information that we have received we know that. The phone should be powered by a Snapdragon 810 SoC, and should have a 1440 x 2560 QHD display. Other information include: 32GB expandable storage, 20 MP rear camera, 5 MP front shooter, USB Type-C port for charging, and 3,300 mAh battery. We also know that it should have 3GB of RAM memory, but it still not confirmed. When it comes to the price, it should be available for $840 in Europe, rest of the world doesn't have any price yet. Sim-unlock.net is a network unlocking company that offers special unlock codes, for Microsoft Lumia models. If you are tired of using the same network all the time, please use our codes and your phone will be free to work in any network.